Expressing the conflicting feelings of loneliness and ‘what if’ which linger after a break-up, directing duo Michael Priestley and Christian O’Keefe headed out to the desert to shoot cathartic music video Space. We speak to the pair about translating the deep sadness of Gracie Gray’s mournful lyrics into an evocative journey towards emotional closure. How did you come to work with Gracie Gray? Christian O’Keefe: We had just finished the music video for Soular System we directed last summer, and we were screening it at a backyard show where they, along with Gracie and a couple other artists, were performing. As soon as we heard Gracie sing, we knew we had to talk to her about doing a video. Her voice is just as powerful live as it is recorded, and it literally gave us both chills. She was a fan of the Soular System video too, so everything really came together well that night. We spoke about the possibility of doing a video, but a few months went by with no movement forward, and during that time she wrote the song Space with a video collaboration in mind. Having just gone through a breakup myself, it was the perfect song for us at the time, and from there we just got to work! To what extent did you draw from Gracie Gray’s soulful lyrics for Space and how did your personal experiences of lost love feed into the concept’s development? CO’K: The opening line is really the one that hit hardest for me: “Sun give me room, I’m not ready for the morning; My love is in space right now.” This is one that Gracie and I related on when we were going through the initial phase of discussion. For me, going through a breakup, I found that mornings were the hardest part of the day. It’s like the opposite feeling of waking up from a bad dream, if that makes sense. The minute you wake up, you are reminded of the loneliness of being without that other person, and it’s hard to face the day feeling that sort of emptiness and that sort of distance. So, that was a feeling we were really trying to push in the video: that isolation of being in the middle of a vast, empty desert, with the sun beating down, and that other person completely out of reach. The other part that really stands out to me is the line: “Tell me how bad you love me…” This feels like the first time in the song where Gracie is speaking directly to her ‘lost love’, and we thought it would be a perfect moment for her to directly address the camera for the first time. It’s sort of like a plea for acknowledgement, and that really resonated with us. Michael Priestley: Since we began working on this video, my personal interpretation of the lyrics has always been that she’s going back and forth between the inquisitive isolation that comes in the aftermath of a break-up, and an unrealistic plea for the relationship to continue. “Are you locked up in your room? Are you planning on coming down?” immediately clashing with the follow-up line “Tell me how bad you love me.” This was instantly relatable to me because that is exactly what life after a breakup feels like. You’re in a constant battle with yourself, searching endlessly in your head for answers that don’t exist, alone. Then comes the occasional idea that the damage in the relationship can be mended and you’ll be reunited like in some movie. But it never plays out quite like that and in time those two radical views of the situation combine and form a version of yourself that sees the world in a completely new light, ready to move forward. We wanted to depict that visually. The two people affected by this lost love are singing the same song in the middle of some isolated place, looking in totally opposite directions. They are slowly growing further and further apart in the space, often looking back for just a moment, and the memories of the time they spent together are playing in their heads, but being pulled away from the viewer, further out of sight. 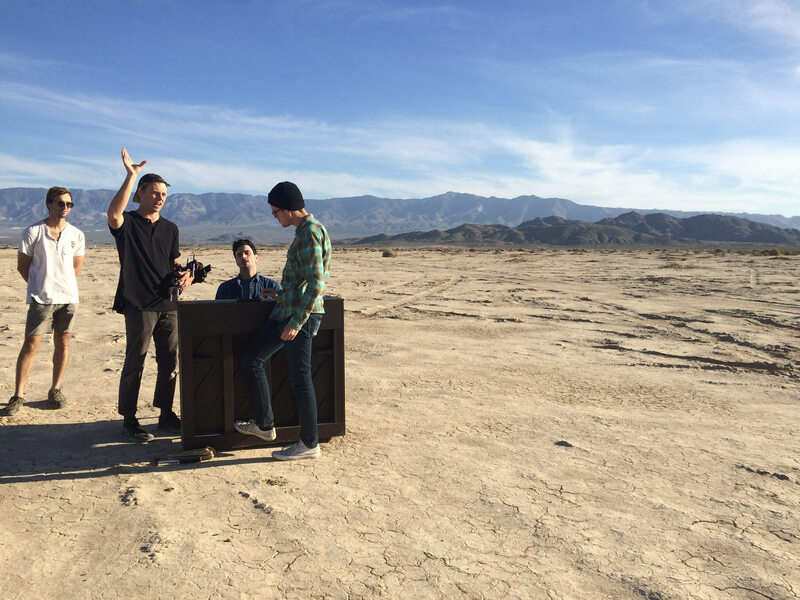 How much of a pain was it hauling that piano out to the desert? CO’K: Oh man, this was something we went back and forth on quite a bit. There is one shot in the video where she is playing the piano, and as the camera orbits around her, you see him playing a similar piano off in the distance in the background. We originally thought it would be a good idea to have two pianos out there for this, but we ended up just doing a little compositing to place him back there in post, and that was definitely the right call (Thanks Mike haha). We ended up borrowing the one piano from Jake Abernathie of Leather Tramp (Gracie’s band) and hauling it out there in a Home Depot truck we rented for the day. That was a little sketchy, because they don’t take reservations, so we had to get to Home Depot first thing in the morning, around 6am, to make sure we could get their one truck for the day. It obviously worked out, and it’s good because Uhaul gas rates would have taken us way over budget, given that we were making a two hour drive out to the desert. Between the two of us, our actor Jacob, and our grip/AC/gaffer extraordinaire, Mitchell, we were able to lift the thing and put it where it needed to be. Actually, as a side note, one of the biggest pains we had was in location scouting, just after we found our spot, and Mike’s car got stuck in a bunch of mud in the middle of nowhere. We literally spent an hour or more digging the thing out with our bare hands. What gear was needed to keep the camera in its state of playful motion and how locked down were those movements before shooting began? Could you explain the significance of the vary frames sizes? CO’K: We shot on a GH4, and were slomo/handheld 99% of the time. For the two long tracking shots in the desert, we used a gimbal courtesy of Mitchell Harris. The camera’s playfulness was just the result of a lot of careful planning and timing in pre-production. We knew we’d be using the sky as sort of a transitional blanket, so it was just a matter of knowing exactly when to tilt up and down, and where we needed to land at each of those points. Everything we shot in the desert was locked down to specific timestamps in the song before shooting so we knew exactly what we needed to get and exactly how we were going to do it before heading out there. We couldn’t risk running out of time and needing to haul a piano out there for a second shoot day. MP: The frame sizes in the video are there as a means of reminding the viewer that the feelings after the loss of love are ever-changing. Moving from an older style aspect ratio to 2.35 is our way of saying that the two of them are moving forward. Ultimately culminating in a very current portrait aspect ratio, emphasizing the sky above, which for better or worse is a way of showing they’re almost completely beyond what is past. A project turns out best when we’re really able to articulate our ideas using just a pen and paper. This is most blatant in the memory sequences because in our minds, we’re playing a ‘greatest hits’ of sorts. We remember what we want to remember, but with hints at why something went bad occasionally sprinkled in. We didn’t want to paint either person in this relationship as the bad guy because in our experience often there is no bad guy. Sometimes things just end. So to use a home video style in those memories gives it the right sense of nostalgia for something of the past, which makes it feel all the more precious. The video then ends with the frame coming almost completely to a close, which is meant to represent closure. We actually had a different ending planned originally, where the camera comes out of his eye, back into the desert, but decided to go with that wide, which we felt better represented that closure. Shout out to Zach Zombek for the feedback and incredible VFX work there. What guided the flowing structure of Space during the edit? MP: The more we’ve worked together, the more we’ve learned that a project turns out best when we’re really able to articulate our ideas using just a pen and paper. Stuff like the memory sequences were shot less traditionally with a lot of improvisation. But that improvisation, locations, colors, etc. were made specific in our initial treatment. The flowing structure of the edit in Space was completely written on paper and time coded to the song in pre-production. When we shot the desert sequences, we knew the camera moves. We knew at what time they occurred. We knew where they led. We never wanted to rely on shooting stuff that we thought looked cool, trusting that we’d make it work in the edit. The desert stuff was more personal than to give it that treatment and we wanted to insure that what we got as a final product was exactly what we felt it needed when we were listening to the song on repeat in pre-production. MP: We’re currently in talks with a few artists to do more music videos. Both of us are big time music nerds, so they’re a perfect combination of our profession and our hobby. But, we also have some narrative projects in the works. We’re currently in pre-production on a short film to be shot this August that is a sci-fi western genre blend. It will hopefully dive even further into the desert isolation spacey-ness of Space. Hopefully all of this will lead nicely toward our goal of a low-budget feature length film debut within the next couple years, which is being written now. So be on the lookout!